The rise time of your 74LVC245A is about twice as fast as the 74LS chips. With a long bus, that fast(er) edge could definitely give you reflection issues. As someone proposed in the last post, some small series resistors should clean that up. Value shouldn’t be too critical – I think 33 ohms was suggested. 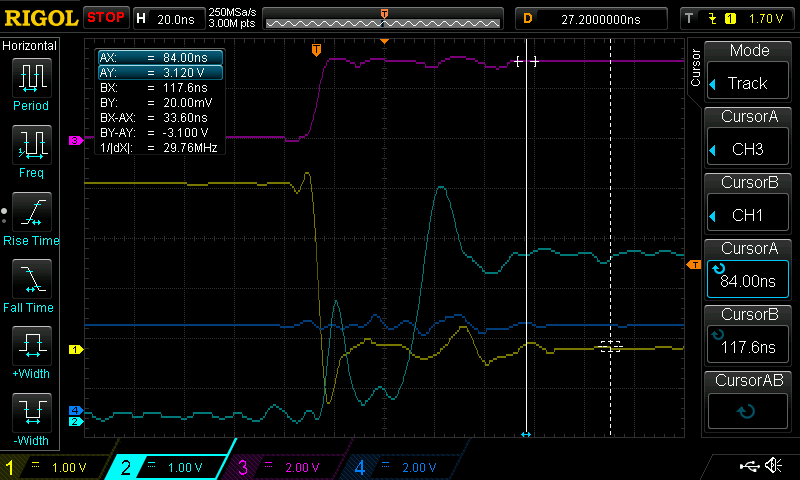 Double-check the ESR of the output capacitor on the LDO against what the data sheet recommends. A mismatch (too much or too little) there could give you oscillation in the output. I’m pretty sure that higher loads exacerbate that. Would series resistors also slow down the edge times for received signals on the bus? Those are coming from a 74LS buffer and are already “slow”, so I don’t necessarily want to make them slower. Perhaps this is a reason to try substituting one of the dual supply buffers that were suggested earlier, like the 74LVC8T245, if their edges are slower. I’m sorry if this is an obvious thing that I’m just missing this morning… but what is L1 doing? Your comment “shoots up to 4.6V (a good trick for a 3.3V chip)” makes me wonder where the extra voltage is coming from… and there’s an inductor, right there, which would be my first suspect. Is it possible that L1 is causing a brief overvoltage of VCC or VCC_F? Have you measured the output voltage on the 20ns timescale alongside the weird logic voltages? At first glance I thought you were using a switching regulator, but I didn’t see a feedback pin… so now I’m wondering if you’re somehow getting an accidental intermittent boost topology switcher out of your linear regulator, depending on the load on each side of the inductor at any given moment. Maybe you need a diode somewhere to keep the back-EMF from the inductor under control? My second guess would be something related to board layout; maybe some board layout issue is giving enough inductance to cause a voltage spike? Are any of the logic lines running near that inductor? Good question. L1 is a ferrite bead, it separates the 3.3V VCC supply from what I called VCC_F on the schematic: the FPGA’s supply. This is the configuration that was recommended by the FPGA datasheet. 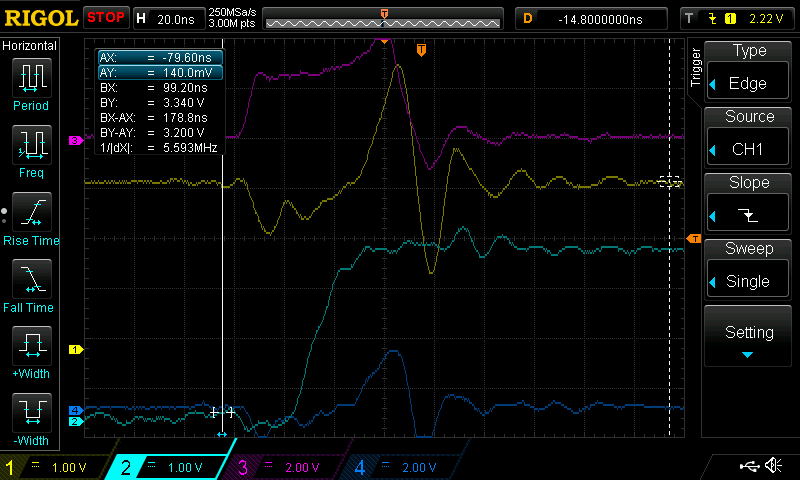 The voltages I’ve measured on the scope were all from VCC and GND, as there’s no place to attach a probe for VCC_F. I had the same suspicion you did about L1, and meant to try a test with it removed/shorted, but I forgot. No logic lines run near L1. I don’t understand your comment about the regulator, sorry. As you can see in the datasheet, there’s no feedback pin. It’s just VIN, VOUT, GND, and an optional enable pin. I removed L1 and replaced it with a straight piece of wire, and the scope plot still looks identical to the title image at the very top of this post. So that wasn’t the problem, unfortunately. “Ferrite Bead” is the sort of thing I’d miss first thing in the morning. Never mind. mentions several ways to adjust the behavior of a ferrite bead to avoid resonant peaks; might be worth a look. I don’t know if it really applies here or not; this level of analog voodoo is more than a bit beyond me. Any chance you can build another prototype of the existing board with a logic family other than LVC? I know I’ve seen retro board designs that say “only use 74LS here” on bus buffers, because other logic families can behave oddly on an older bus. This was for boards on an ECB bus, though. Have you, or others, had success using LVC buffers on an Apple II card in other projects? The top-most scope plot shows VCC on channel 4 (dark blue). I incorrectly called it GND in the text. The other plots do show GND on channel 4 though. Under “Limiting Values”, the Vo output voltage is rated to 6.5V max when the outputs are tri-stated. 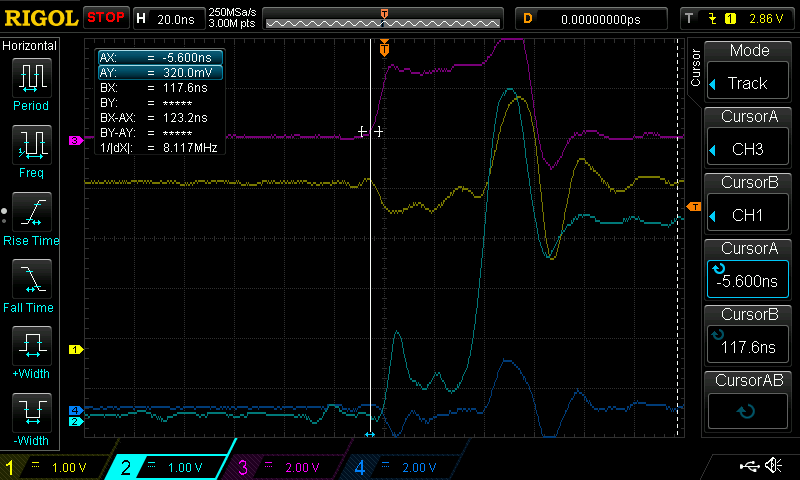 But when the outputs are diving high or low, it’s limited to only VCC + 0.5V, which is 3.8V for my circuit. If the bus voltage temporarily exceeds 3.8V while the 74LVC245 is driving the bus, due to a brief bus collision, or a signal reflection, or maybe capacitance on the bus briefly holding an old 5V value, bad things (like what?) could happen. Could this be the cause of what I’m seeing? If at all possible, try adding some series resistors between the drivers and the bus connector. It should isolate the drivers from the large capacitance of the bus, but the bus should still be able to drive the tiny input capacitance of the logic ICs. Also, it limits the current during overvoltage events like the ones you mentioned above. Thinking about it, a 3.6V-Zener and a resistor in front of it might be even better. A specification like VCC + 0.5V usually means that there is an ESD protection diode from that pin to VCC. It starts conducting once its forward voltage of about 0.5 V is reached. There is nothing really limiting that current, so it can destroy the diode, the output driver or even cause a latch-up condition. Since the inputs are 5V tolerant, it’s probably not going through the ESD diode. My guess is that it would flow through the P-channel MOSFET’s body diode into the 3.3V rail. Randy, that makes sense. Any idea how they disconnect the body diode when switching the direction to an input? I also second the idea of adding/adjusting termination. If you’re going to update the design, I’d add provisions to do so. Series termination at your drivers, AC termination at your receivers. So this is probably a dumb question, but I also have a project that requires level shifting. My thinking is they have to be tristate so that all the level shifters essentially “disappear” from the bus when your card is inactive, for all signals – DATA, ADDR, and CONTRL. Anyway, I am looking at using the 74LVC8T245 because it is 3-state and bidirectional and it wasn’t that clear to me WHETHER ALL the variations of this chip are 3-state. Anything 74xxx245 is a bidirectional tristate-able bus driver.